If you are on a tight budget and wish to be married in a small private ceremony I am offering my home as a venue for parties of eight or fewer people. We can accommodate the couple, two witnesses, and two sets of parents A(or four guests total) only. I can marry you indoors or out — in the family room or living room, or on the patio or deck — depending on the weather. Since you’ll be coming here, the fee is only $150. This is a “no frills” elopement. 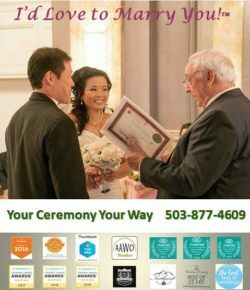 Just bring your witnesses and your valid marriage license and we’ll get the knot tied for you! Please call 503-877-4609 or email jonturino@gmail.com to see if your date and time is available.